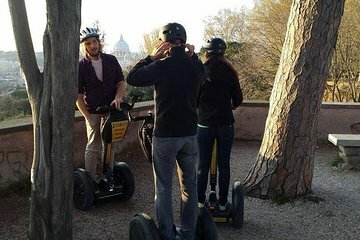 Explore Rome the fun and easy way on a private half-day Segway tour! Cruise through the sprawling city streets with ease while your personal guide shows you the best of Rome’s ancient monuments and tucked-away treasures. Go at your own pace, stop as often as you like and request to visit any sites that particularly interest you. Start off with a Segway lesson in a safe pedestrian zone to get comfortable on the self-balancing scooter, and then set off on a customized day full of action — with none of the foot fatigue. We had a spectacular private tour for myself and my 14 year old granddaughter. We were able to design the tour to include sites that were important to us and Robert knew how to make historical information interesting without boring a teenager. With just the 3 of us Robert found some special vantage points for viewing the colosseum away from anyone else. This is the best way to get an overall understanding of ancient Rome, cover a lot of ground and not be exhausted. We had some rain and it didn't matter a bit, it was an A experience.